Preheat oven to 350 degrees F. Grease 12 muffin cups, or line with paper muffin liners. In a large bowl, mix together flour, sugar, baking soda, nutmeg, cinnamon, and salt. Stir in the carrot, apple, raisins, walnuts, and coconut. In a separate bowl, beat together eggs, oil, and vanilla. Stir egg mixture into the carrot/flour mixture, until just moistened. Scoop batter into prepared muffin cups. 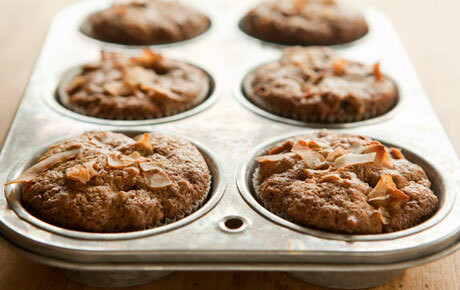 Bake in preheated oven for 20-25 minutes, until a toothpick inserted into center of a muffin comes out clean.